Until recent years, the notion that Zionism was a benign, indeed a humanitarian, political movement designed for the noble purpose of creating a homeland and refuge for the world’s stateless, persecuted Jews was a virtually universal assumption. In the last few years, particularly since the start of the al-Aqsa intifada in 2000, as Israel’s harsh oppression of the Palestinians has become more widely known, a great many Israelis and friends of Israel have begun to distance themselves from and criticize Israel’s occupation policies, but they remain strong Zionists and have been at pains to propound the view that Zionism began well and has only lately been corrupted by the occupation. Alam demonstrates clearly, through voluminous evidence and a carefully argued analysis, that Zionism was never benign, never good — that from the very beginning, it operated according to a “cold logic” and, per Rumi, had “no humanity.” Except perhaps for Jews, which is where Israel’s and Zionism’s exceptionalism comes in. Alam traces in detail the progression of Zionist planning, beginning with the deliberate creation in the nineteenth century of an ethnic identity for Jews who shared only a religion and had none of the attributes of nationhood — neither a land, nor a common language or culture, nor arguably a common gene pool. Here Alam covers briefly the ground trod in detail by Israeli historian Shlomo Sand, whose book The Invention of the Jewish People, appearing in English just months before Alam’s book, shattered the myths surrounding Zionism’s claim to nationhood and to an exclusive right to Palestine. But Alam goes further, describing the Zionist campaign to create a surrogate “mother country” that, in the absence of a Jewish nation, would sponsor the Zionists’ colonization of Palestine and support its national project. Having gained British support for its enterprise, Zionism then set about building a rationale for displacing the Palestinian Arabs who were native to Palestine (who, incidentally, did indeed possess the attributes of a nation but lay in the path of a growing Jewish, Western-supported military machine). Zionist propaganda then and later deliberately spread the notion that Palestinians were not “a people,” had no attachment to the land and no national aspirations, and in the face of the Jews’ supposedly divine mandate, of Israel’s “miraculous” accomplishments, and of the Jews’ monumental suffering in the Holocaust, the dispossession of the Palestinians was made to appear to a disinterested West as nothing more than a minor misfortune. In the same vein, Alam contends, Zionists realized that in order to succeed in their colonial enterprise and maintain the support of the West, they would have to create an adversary common to both the West and the Jews. Only a Jewish state waging wars in the Middle East could “energize the West’s crusader mentality, its evangelical zeal, its dreams of end times, its imperial ambitions.” Arabs were the initial and enduring enemy, and Zionists and Israel have continued to provoke Arab antagonism and direct it toward radicalism, to steer Arab anger against the United States, to provoke the Arabs into wars against Israel, and to manufacture stories of virulent Arab anti-Semitism — all specifically in order to sustain Jewish and Western solidarity with Israel. More recently, Islam itself has become the common enemy, an adversary fashioned so that what Alam calls the “Jewish-Gentile partnership” can be justified and intensified. Focusing on Arab and Muslim hostility, always portrayed as motivated by irrational hatred rather than by opposition to Israeli and U.S. policies, allows Zionists to divert attention from their own expropriation of Palestinian land and dispossession of Palestinians and allows them to characterize Israeli actions as self-defense against anti-Semitic Arab and Muslim resistance. Alam’s conclusion — a direct argument against those who contend that the lobby has only limited influence: “It makes little sense,” in view of the pervasiveness of Zionist influence over civil society and political discourse, “to maintain that the pro-Israeli positions of mainstream American organizations . 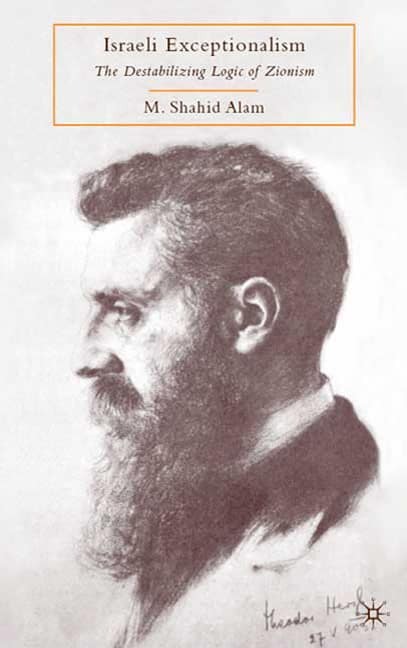 . . emerged independently of the activism of the American Jewish community.” In its early days, Zionism grew only because Herzl and his colleagues employed heavy lobbying in the European centers of power; Jewish dispersion across the Western world — and Jewish influence in the economies, the film industries, the media, and academia in key Western countries — are what enabled the Zionist movement to survive and thrive in the dark years of the early twentieth century; and Zionist lobbying and molding of public discourse are what has maintained Israel’s favored place in the hearts and minds of Americans and the policy councils of America’s politicians. Kathleen Christison is the author of Perceptions of Palestine and the Wound of Dispossession and co-author, with Bill Christison, of Palestine in Pieces: Graphic Perspectives on the Israeli Occupation, published last summer by Pluto Press. She can be reached at kb.christison@earthlink.net. This article was first published by CounterPunch on 3 February 2010; it is republished here with the author’s permission.